Here are three preview images from the forthcoming Beasts: A Pictorial Schedule of Traditional Hidden Creatures From the Interest of 90 Modern Artisans. Fantagraphics is releasing this beauty in January, but I couldn't resist sharing a few images here. 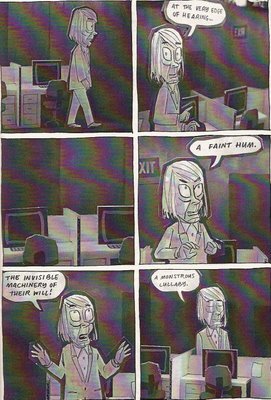 Rege Jr. and Nilsen have been featured here before for mini-comics, so it's not entirely out of line to post these images at SIZE MATTERS. Plus it's my damn blog and I'm very excited about this book. Beasts is a 200 page hardcover dreamed up by the talented Jacob Covey. 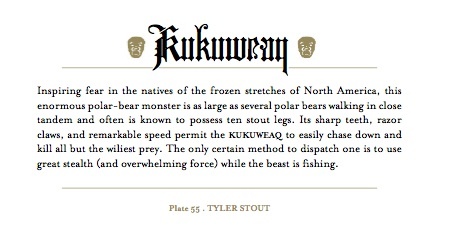 Inside, 90 artists give their take on monsters actually thought to exist at one point. And just maybe some of these creatures do still exist... Each beast gets the full color treatment and on the facing page a short paragraph gives the details. Tom at Comics Reporter has more images from Beasts, including Tom Gauld and Mat Brinkman. As you would expect over 71 strips, not every one translates to the reader. In relationship comics, the cartoonist knows exactly what he or she wants to express, but it’s not always clear to the reader. The inside jokes don’t always translate. Brown does a good job here though, hitting the mark more often than not. He sticks to basic scenes of early relationship bliss, giving readers the required information. The art is very simple. 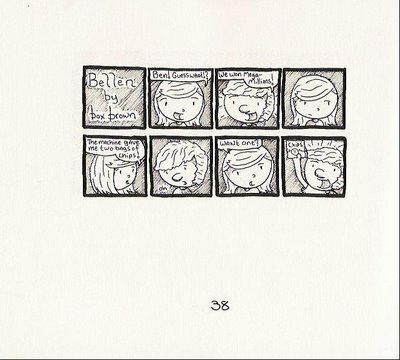 Tiny panels float in groups on a sea of white page. 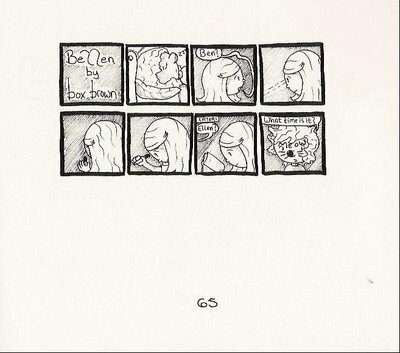 Inside the panels, Brown sticks to head and torso shots of Ben and Ellen, occasionally tossing in Ellen’s cat. He uses almost no background. Instead, he uses diagonal lines running parallel to fill in panels. Bellen! records random moments in a relationship. It’s possibly too saccharine for some readers, but I found it charming. 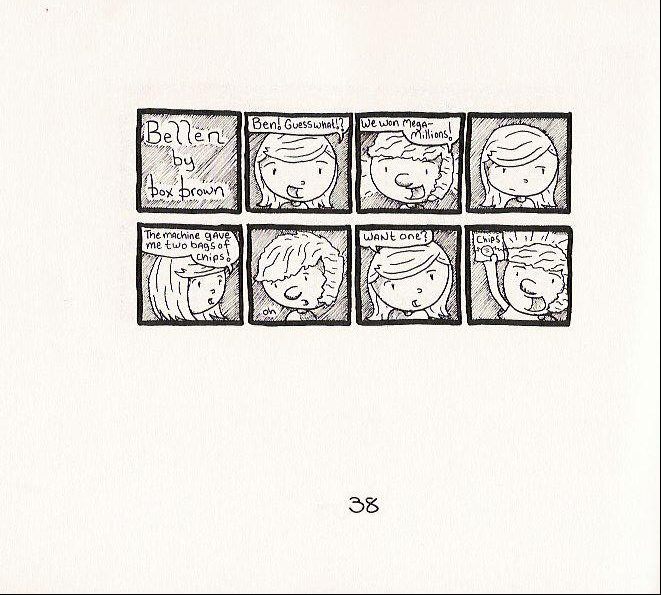 You can check out Box Brown's strips at his My Space Page and buy Bellen! here for $7. He's also on WebComics Nation. Leslie Overnight is the result of a larger project, Opolis, at the Flux Factory in Queens. A group of artists constructed individual beuildings out of paper and cardboard. 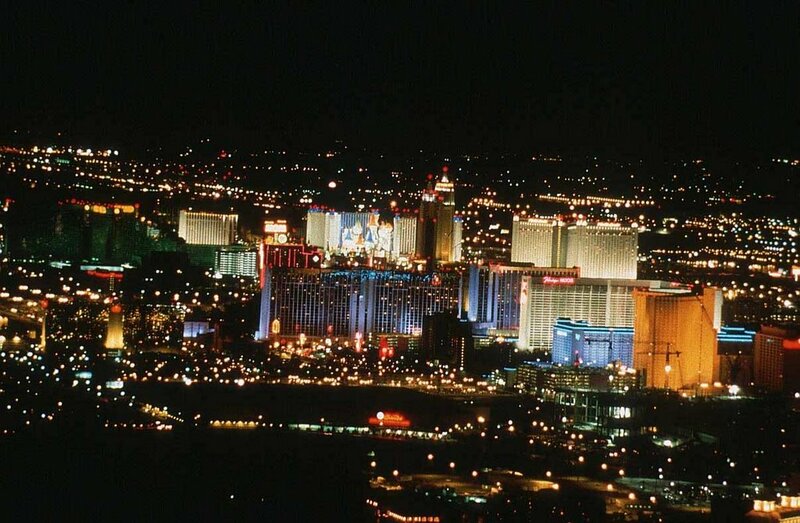 Visitors walk among the buildings, peering into the windows to follow the story within. Above you can see the structure of the building. In the comic, different versions of Leslie creep around the building. To make the comic, Jay photographed each scene and assembled them in order. 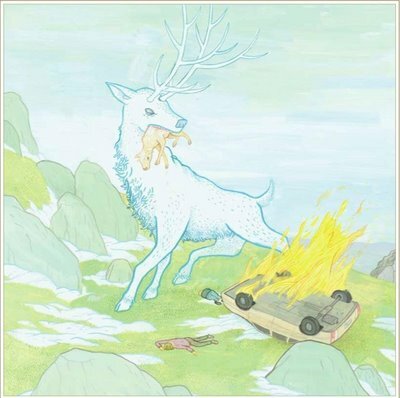 In this story, Leslie is a bit of a kook. At one point, he even breaks out the tin foil hat. Jay doesn’t simply make a static image of Leslie and move him around; there must be dozens of cutout Leslie figures to fit in with different scenes. 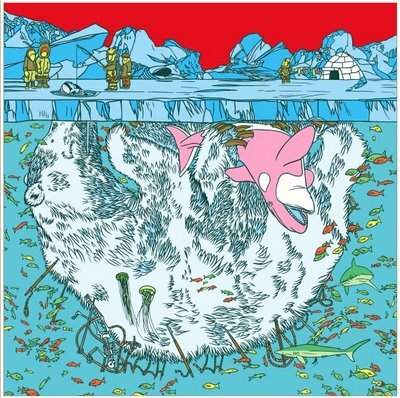 If you sit down and really look at this comic, you realize just how much work he has done to pull this off. Jay has drawn and cut out dozens of Leslies, multiples of the security guard character, and the various word balloons. He then had to place the cutouts correctly for each panel before taking a photo of each. Multiply this by 30 pages. The finished product is much richer than it sounds. The cardboard scenery kind of adds to the realism, as weird as that sounds. The props have more fullness than something merely drawn. As Leslie floats through each panel, the office desks, cubicle walls, and other details create a stage prop feeling. 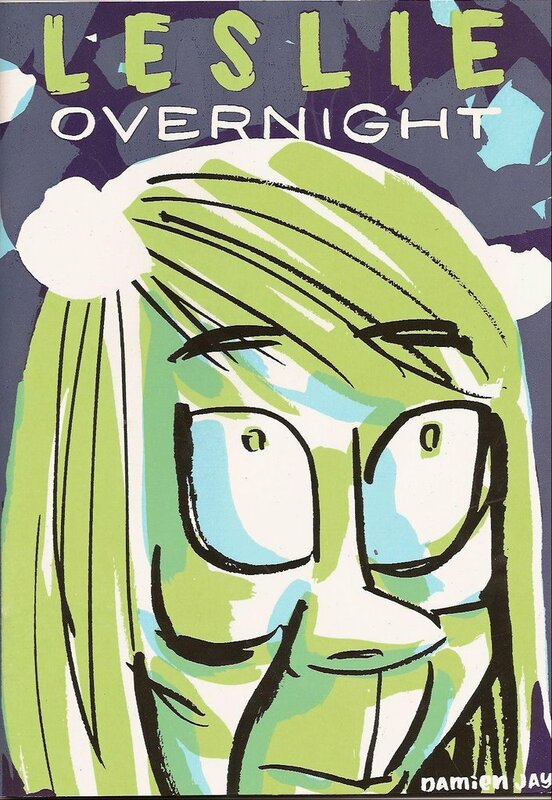 The cover of Leslie Overnight is striking. 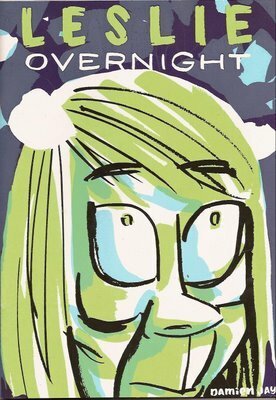 First, it’s larger than your standard mini-comic, but second the close up image of Leslie’s face is unforgettable and a little disturbing. Jay did a fantastic job on the screen printing as well. I don’t see a price on this, but according to Jay’s website it’s $4. 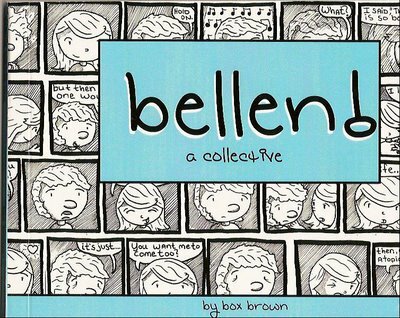 You can read the comic on his website, but take it from me; this is a nice one to hold in your hands. Leslie Overnight is unique and charming. It reminds me why I love mini-comics. 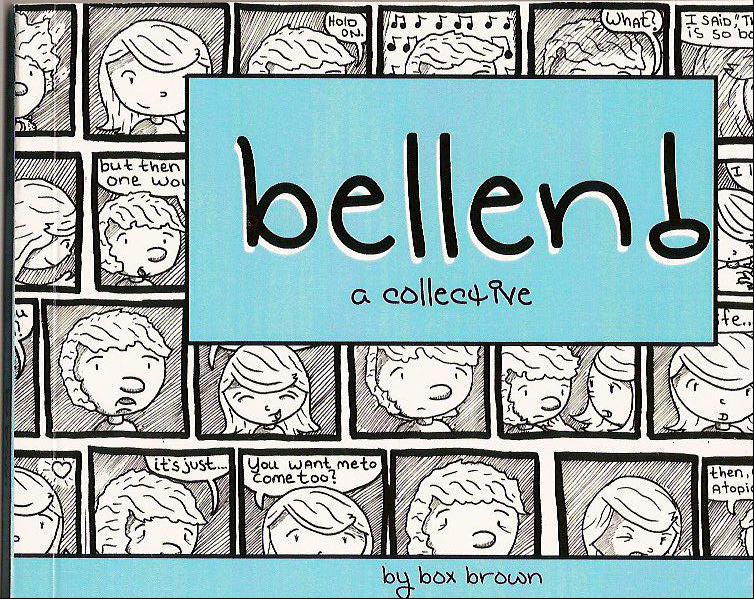 Mini-comic and art fans everywhere, keep your eyes peeled for the latest issue of The Drama. In my humble opinion, the ninth issue is the best yet. There’s a photo-packed feature on the “Wunderground: Providence: 1995 to the Present” exhibit and a high energy (you just have to read the damn thing) interview by Dan Nadel with Brian Chippendale. Of course, you’ll also find the comic section in the back featuring Leif Parsons, Tom Kaczynski, Sabine Allaire, Peter Thompson, Matthew Thurber, Vanessa Davis, Zak Sally, David Abbott, Bendik Kaltenborn, Laura Park, Max Hubenthal, Nicolas Robel, Christopher Norris, Marc Bell, Mark Burrier, Mike Ball, Derek M. Ballard, Lori D., Alex Lukas, & Travis Robertson. That’s pretty darn exciting. If you can’t find it at your local newsstand or bookstore, you can grab a copy from the Drama store online. 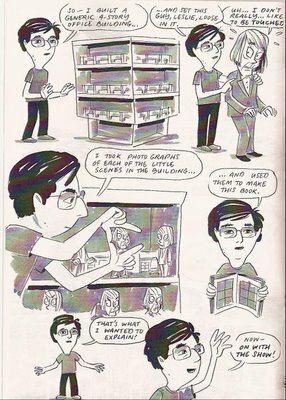 I reviewed mini-comics from Grant Reynolds and J.P. Coover for this issue, so you know it’s fantastic. PS- Congrats to America today. The Republicans have lost a good measure of control and Rumsfeld has stepped down. Yay us! 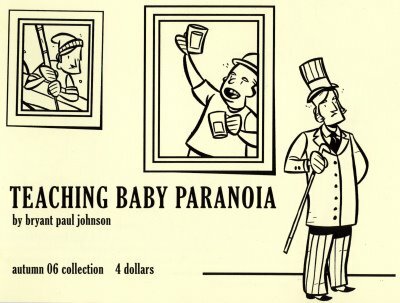 Win a signed copy of Teaching Baby Paranoia by Bryant Paul Johnson over at interet pal Dave's website. What are you waiting for? Go pay Dave a visit and enter his contest. 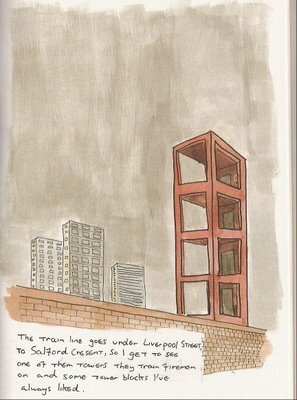 In Trains Are Mint, Oliver East takes readers on a lovely tour of Manchester train stations. Starting at the Oxford Road Station, he highlights the things that strike him along the way. East is on a journey with no goals save understanding and a pint at the end of the track. 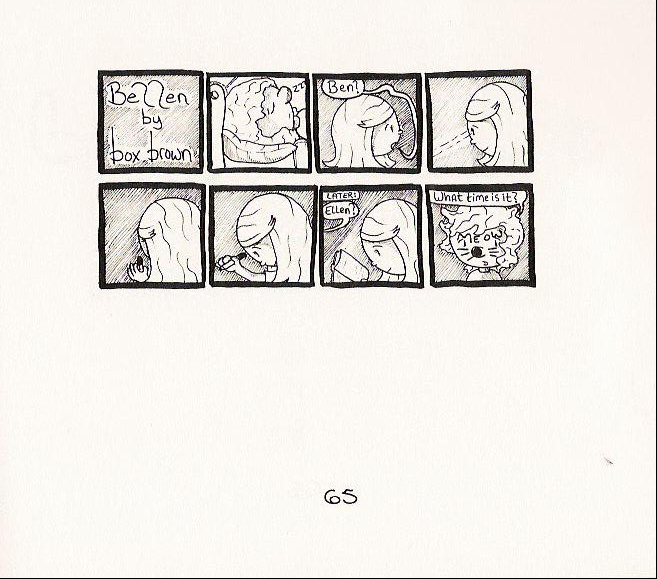 The real beauty of this mini-comic is in the watercolor or paint wash art. His tour is intimate and real, but the art is fantastic. East uses simple shapes and unique angles to suggest innocence, even when he’s looking at a dodgy alleyway. His cars are the cars that we learned to draw as children. 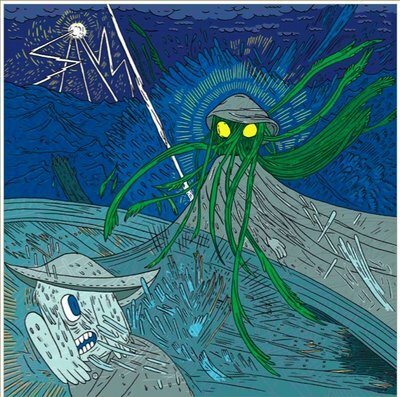 There’s a bit of Allison Cole in his art. 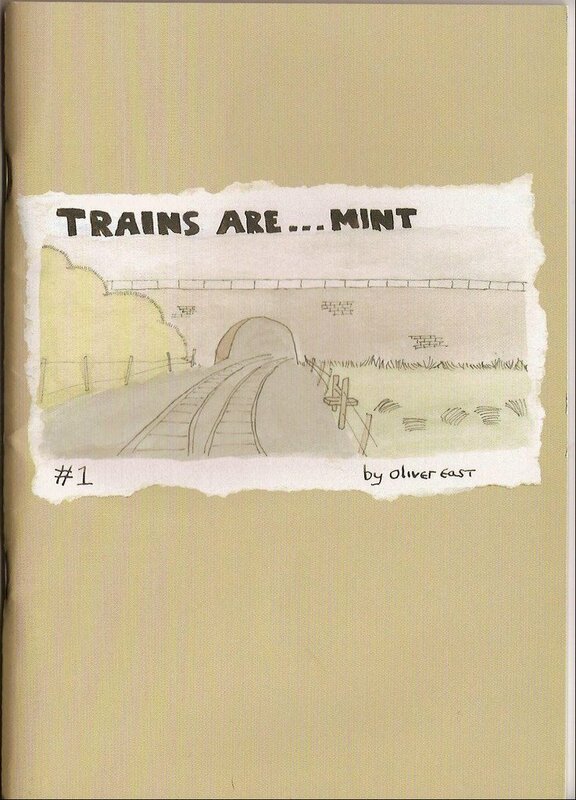 Trains Are Mint is a great example of what mini-comics do so well. 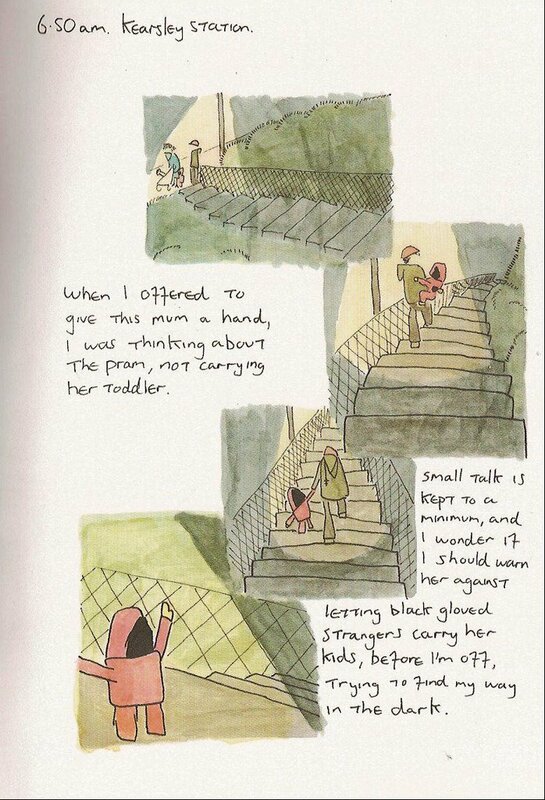 East takes something important or interesting to him, and puts it on the page for a small audience to discover. What I like about East’s effort is the extra touches. The watercolor art is gorgeous. He uses a neutral, stiff card stock for the cover with plenty of information for the reader inside the back cover. He doesn’t list a price, but you’ll find a website and a MySpace page that tells you everything you need to know. And if that’s not enough, he has page samples! Nice job, Oliver. Give him a shout. 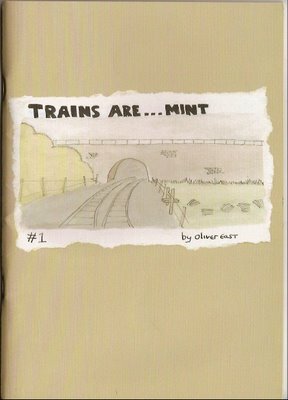 Order your own copy of Trains Are Mint. Looks like he’s only made 500 copies of this first issue.